Tell a friend about us and you could earn a $100 in credit! 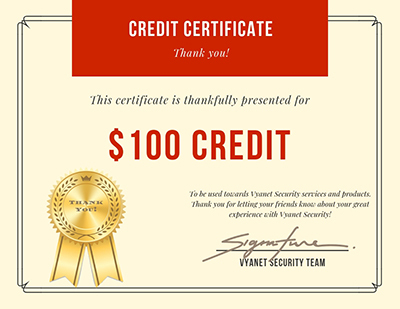 Our Refer A Friend program can earn both you and your referred friend $100 credit EACH towards Vyanet Security’s services and products. If you’ve enjoyed the peace of mind our service is providing you – why not let your friends in Grants Pass and Medford know how they can benefit as well? We here at Vyanet Security really appreciate the good word our customers in Grants Pass and Southern Oregon have been spreading about us. Most of our clients are with us because they’ve been referred by clients like yourself! 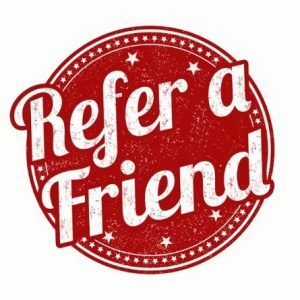 With so many people sending us business, we decided to create our Refer A Friend program as a way to say “Thank You” for letting people know about us. Our program is simple. Let your friends know how happy you’ve been with us and for every referred person that results in a sale of a new monitored security system, we will automatically credit your account with $100. Been looking for a new upgrade? Apply your new credit towards new equipment! Or maybe you’d like to use it towards your current central station monitoring costs. However you choose to use your credit is up to you and remember, your referred friend just got the same $100 credit to use too! You can benefit from this offer right now – simply fill out the form on this page or call us directly with your referral. If the person you refer to us signs up for security services, a $100 credit will be applied to your account within 60 days of the time their services start. We sincerely appreciate you spreading the word about Vyanet Security!